Roof Construction: Applicable roof construction is as follows: Built up or single-ply membrane installed over, and in continuous contact with, a layer of insulation or an insulating deck. Roof may be either smooth, granule, or gravel-surfaced. If gravel surfaced, stones should be pea sized or smaller. Equipment: For highly reflective and smooth-surfaced roofs, use a short wave (3-5 micron) imager to overcome reflections caused by nighttime sky. For gravel or granule surfaced roofs, one may use either a long wave or short wave camera with good results. Roofing Materials: Some materials are more difficult to inspect than others. Roofs having lightweight concrete or gypsum can be more difficult to inspect because they can retain significant quantities of moisture either left over from construction or due to building usage. Water Ingress: Not all water that enters a roofing system will enter the insulation system. Infrared inspections rely on moisture being absorbed by roofing system components causing a change in thermal capacity or thermal conductivity. Should water bypass the roof insulation, no unusual thermal patterns will be observed. Moisture Content: The amount of moisture within the roofing system will have a direct impact on the images observed. The clear, well-defined IR images found in text books are not always found in the field. Additionally, roofs which are completely saturated will not exhibit clear thermal patterns but will often exhibit a mottled thermal pattern. Moisture Verification: To ensure accuracy all infrared data must be verified through invasive testing and the results correlated with infrared data. Remember, an infrared imager is not a moisture meter. Experience: Because thermography is an art as well as a science, an experienced operator may be able to shed some expertise on difficult roofs. This is a situation where working with a mentor can be especially helpful or you may wish to work with an experienced infrared consultant who specializes in roof inspections. Proper conduct and documentation of infrared inspections of flat roofs is detailed in the Standard for Infrared Inspections of Insulated Roofs. Copies of this comprehensive document are available in PDF format through the Infraspection Online Store. Enter value obtained in Step 5 into radiometer’s computer under reflectance input – commonly labelled Background, TAmbient, or Reflected Temperature. Lastly, be sure to maintain a safe working distance from any energized or potentially dangerous targets. The topic of reflected temperature is covered in depth in the Infraspection Institue Level II Certified Infrared Thermographer training course. Copies of Infraspection Institute’s Standard for Measuring and Compensating for Reflected Temperature Using Infrared Imaging Radiometers are available in PDF format from the Infraspection Online Store. Thermographers often work in environments that require the use of respiratory protection. In this Tip we discuss the selection and use of common respirator types. A respirator is a device designed to protect the wearer from inhaling harmful dusts, fumes, vapors, or gases. There are several types of respirators, each having a different intended application. Several types are listed below along with their applications. Approved filtering face pieces (dust masks) can be used for dust, mists, welding fumes, etc. They do not provide protection from gases or vapors. DO NOT USE FOR ASBESTOS OR LEAD; instead, select from the respirators below. Thermographer safety is one of the many topics covered in the Infraspection Institute Level I Certified Infrared Thermographer® training course. For more information or to register for a course, visit Infraspection Institute or call us at 609-239-4788. Acquire and use a graduated set of collection letters for your delinquent accounts. Sample collection letters are readily and freely available on the internet, starting with a gentle reminder and increasing in impatience until the matter must be referred out to an attorney. Copy your lawyer with your final collection letter. Many times, a cc: line on the bottom of the letter is all it takes to convince your debtor that he’s had his last warning. Don’t forget to actually send the copy. 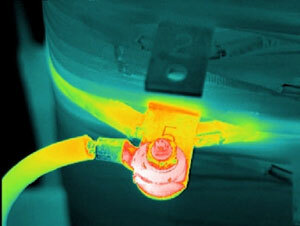 Infraspection Institute offers a wide variety of Distance Learning courses for thermography. Courses include: Certification Prep, Applications and Industry-Specific Courses. All courses are ASNT compliant and are taught by Level III Infraspection Institute Certified Infrared Thermographers® each having over 20 years experience. For more information on Infraspection’s Distance Learning Courses, call us at 609-239-4788 or visit the Infraspection website. Marketing of infrared inspection services is one of the many topics covered in the Level III Infraspection Institute Certified Infrared Thermographer® training course. For more information on infrared training and certification, please call 609-239-4788 or visit us online at www.infraspection.com. The above procedure is described in detail in the Standard for Measuring and Compensating for Emittance Using Infrared Imaging Radiometers. Copies of the Standard are available form the Infraspection Online Store or by calling 609-239-4799. Each year, lightning kills an average of 67 people in the United States; hundreds more are injured. Few people really understand the dangers of lightning. Many who fail to act promptly to protect their lives and property don’t understand the dangers associated with thunderstorms and lightning. Thunderstorms are most likely to develop on warm summer days and go through various stages of growth, development, and dissipation. On a sunny day, as the sun heats the air, pockets of warm air start to rise in the atmosphere. When this air reaches a certain level in the atmosphere, cumulus clouds start to form. Continued heating can cause these clouds to grow vertically upward in the atmosphere into “towering cumulus” clouds. These towering cumulus clouds may be one of the first indications of a developing thunderstorm.